Sometimes you need one of those easy to go to meals. One where you can just chuck it all into a pan and it's fine in an hour or four. My lot all come in at different times for tea. Dylan has taken up going to the gym so he doesn't get in until 9pm, and to be honest, I'm not up for getting off the sofa and cooking a whole fresh dinner at that time. So, I need a few throw it in a pan and leave it type of teas. But I don't want to compromise on flavour. In a large heavy based saute pan heat the oil, add the potatoes and onions and gently fry. Add the thai paste, cook for a few minutes, add the stock and stir until the paste is well combined. Simmer for 5 minutes then drain the clear liquid from the coconut milk and stir the milk into the curry. Stir again until combined then add the chicken and sugar, cover and place in a preheated oven for 30 minutes, turn down the oven to 100 and leave covered until ready to serve. 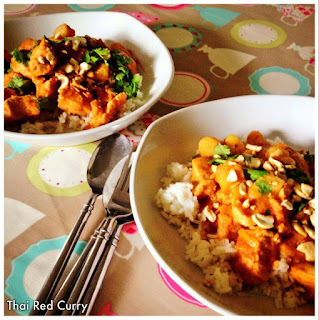 Serve with sticky rice and top with chopped coriander and cashew nuts.